Video footage of Mikheil Saakashvili, Georgia’s former president and ex-governor of Odessa region, being detained in Kiev has appeared on social networks. The short clip posted on Saakashvili's official Facebook page, shows several armed men in green military uniforms entering a restaurant in downtown Kiev on Monday and ordering several customers to lie down on the floor. This is followed by images of four uniformed men dragging a man, purportedly Saakashvili himself, towards a car parked outside. Later in the day, the Ukrainian border service deported Mikheil Saakashvili to Poland from where he illegally entered Ukraine last fall forcing his way through cordons of Ukrainian border guards and police. Polish border authorities have confirmed Saakashvili’s arrival in Warsaw where he told the local ZIK broadcaster that he will find legal ways of getting back to Ukraine. 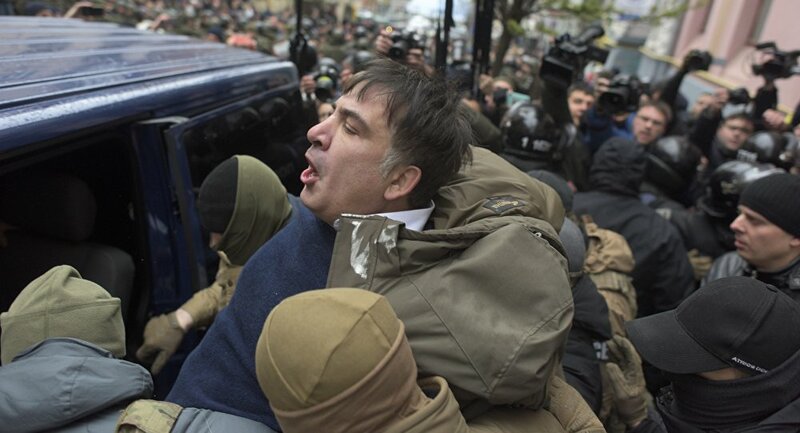 In Kiev, Saakashvili’s supporters rallied outside the presidential headquarters and clashed with police. Mikheil Saakashvili was invited to Ukraine by President Petro Poroshenko and granted Ukrainian citizenship. He held a regional governorship from 2015-2016 before falling out with Poroshenko and joining the opposition.